The outside of our refrigerator is wallpapered in clutter. A ridiculous caricature. (Who are those weirdos?) Sweet baby Agnes’ birth announcement. An outdated Christmas card with our cute nieces running amok. An ugly magnet that touts the benefits of green tea that I like to gaze at while drinking my coffee. It's anything but sleek and stylish, but each strange artifact makes me happy. My parents’ fridge is adorned with the same sort of sentimental clutter. A photo of my mom and some of her collegues. Junky magnets from various travels. A passport-photo outtake from when I was 4, sporting a lustrous bowl cut. There is also something particular that always warms my heart when I see it. Amid the detritus, stuck to the left side, is a regular old yellow post-it. You know, the kind people use to leave reminders in offices. (Someone once left me a post-it note with my name written as Samantha Senevblahblahblah. I loved that.) This post-it isn’t pretty. It doesn’t have an important phone number on it. It’s just a short, scribbled message from me. It says “Sticky Gingerbread for Sweet Mom and Sweet Dad. Keep it in the fridge so it becomes moist and delicious.” It’s a note I don’t even remember writing. I guess I tucked it into some cake-filled package that I sent them years ago. They’ve never mentioned the note to me. I have no idea when I sent the gingerbread. But the note has lived on their fridge for years and years. I’m so glad that they have that post-it on the fridge. It tells me that they got the message. You know. Really got my message. Baking is how I say what I feel. I put my heart into every batter and dough. Beloved by me means a few extra pounds for you. You’re welcome. I love you. 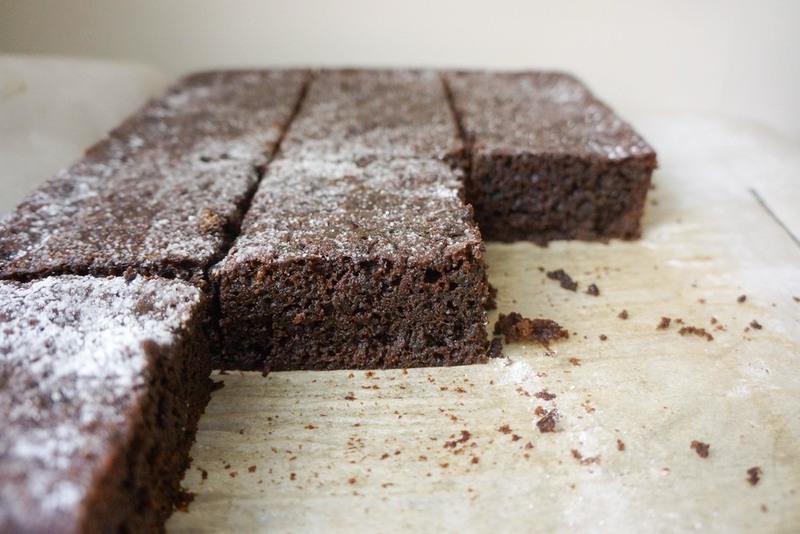 So here is a recipe for some dense, rich, sticky gingerbread. It’s really perfect for sending to your loved ones because it gets better as it ages. Not that it will last that long. Now that the gift-giving holidays have passed I suggest you share a surprise treat with someone who deserves to know how you feel about them. Send them this cake and I promise they’ll get the message. This cake is a serious, grown up gingerbread. The molasses flavor runs deep and it is accented with a heavy dose of spice. I like to eat it ice cold and dense straight from the fridge with a cup of hot tea. The edges are out of this world. 1. Preheat oven to 325°. Lightly oil a 13x9 inch baking pan. Line with parchment with a 2-inch overhang on two sides. Butter the parchment. 2. In a medium bowl, whisk together the flour, ground ginger, cinnamon, baking soda, cardamom, salt, and clove. In a large bowl, whisk together butter, brown sugar, honey, molasses, and ginger. Stir in sour cream, milk, and eggs. Pour batter into prepared pan and bake until cake is set a toothpick inserted into the center has moist crumbs attached, about 55 minutes. Let cool completely in pan on a wire rack. 3. Transfer cake to a cutting board and cut into slices. Sprinkle with confectioners’ sugar to serve.